Spatio-temporal variation in tropical savanna tree cover remains poorly understood. We aimed to quantify the drivers of tree cover in tropical mesic savannas in Kakadu National Park by relating changes in tree cover over 40 years to: mean annual rainfall, fire activity, initial tree cover and prior changes in tree cover. Aerial photography, acquired in 1964, 1984 and 2004, was obtained for fifty sites in Kakadu that spanned a rainfall gradient from approximately 1200 to 1600 mm.The remotely sensed estimates of tree cover were validated via field survey. Linear mixed effects modelling and multi-model inference were used to assess the strength and form of the relationships between tree cover and predictor variables. Over the 40 years, tree cover across these savannas increased on average by 4.94  0.88%, but was spatio-temporally variable.Tree cover showed a positive albeit weak trend across the rainfall gradient.The strength of this positive relationship varied over the three measurement times, and this suggests that other factors are important in controlling tree cover.Tree cover was positively related to prior tree cover, and negatively correlated with fire activity. Over 20 years tree cover was more likely to increase if (i) tree cover was initially low or (ii) had decreased in the previous 20-year interval or (iii) there had been fewer fires. 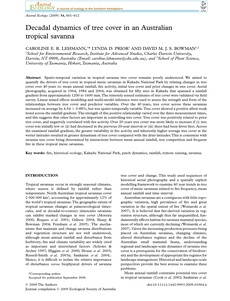 Across the examined rainfall gradient, the greater variability in fire activity and inherently higher average tree cover at the wetter latitudes resulted in greater dynamism of tree cover compared with the drier latitudes.This is consistent with savanna tree cover being determined by interactions between mean annual rainfall, tree competition and frequent fire in these tropical mesic savannas. fire, historical ecology, Kakadu National Park, patch dynamics, rainfall, remote sensing, savanna.